Since 2005, the Dietary Guidelines for Americans have encouraged all of us to “make at least half our grains whole.” But are we listening? According to new data from the WGC’s 2015 Whole Grains Consumer Insights Survey, the answer is a resounding yes: nearly two-thirds of Americans say they’re making half or more of their grains whole. With the help of SSI (Survey Sampling International), we reached out to 1,510 U.S. adults from July 27 to August 3, 2015. Our goal was to answer some of the key questions journalists ask us day in and day out: “How has whole grain consumption changed since 2010?”… “What percentage of people have stopped eating gluten?”… “How do consumers actually use the Whole Grain Stamp?”… and more. The responses – highlighted below – were fascinating. Nearly two-thirds (64%) have increased whole grain consumption “some” or “a lot” in the last ﬁve years. Useful to know, since the most recent oﬃcial USDA data are from 2010. Almost one-third of respondents (31%) say they nearly always choose whole grains. Five years ago, only 4% would have said this. 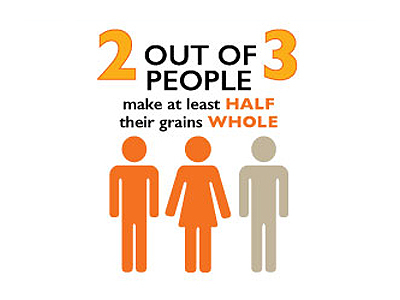 Another third (32%) choose whole grains about half the time. Combined with the “nearly always” group, this makes 63% making half or more of their grains whole, in line with the Dietary Guidelines for Americans. We eat about 37% of our whole grains at breakfast, 27% at dinner, 22% at lunch, and just 14% as snacks. One possible reason? It’s often harder to ﬁnd whole grains outside of the home, where most lunches and snacks are generally eaten. Nearly 9 out of 10 (86%) of those who consume whole grains do so for the health beneﬁts. It’s not surprising that most people realize whole grains are healthier. Four in 10 (40%) choose whole grains because they enjoy the taste. Used to be, way back, that taste was at best a neutral factor. Now it’s becoming a real motivator! Cost was named as the leading barrier to eating more whole grains (39%). Unfortunately, many whole grains – especially breads – cost more than reﬁned grains. Some folks aren’t yet accustomed to the fuller, nuttier taste of whole grains (37%). But we’re glad to see those who prefer the taste of whole grains (40%) are beginning to pull ahead! Availability can also be a barrier (28%), especially since many restaurants don’t oﬀer whole grain choices. 21% incorrectly think gluten is in all grains. In fact, gluten free doesn’t mean grain free – even those following a gluten-free diet can enjoy grains such as amaranth, buckwheat, corn, millet, oats, quinoa, rice, sorghum, teﬀ, and wild rice. 93% eat gluten some or all of the time. Of the 7% who completely avoid gluten, only 1 in 5 has a medically-diagnosed problem with gluten. The bottom line: only 1.5% have a medical reason to avoid gluten completely — a number very much in line with experts’ estimates of celiac disease in the general population. Old favorites — whole wheat, oats, and brown rice — are most popular with Americans. 9 out of 10 have heard of these three whole grains, and most have eaten them. Despite all the attention paid to “exotic” grains, fewer than 1 in 5 has heard of (let alone tasted!) spelt, farro, amaranth, Kamut®, or teﬀ. We always remind folks that, just as eating a variety of vegetables is healthier, eating a variety of grains is good too — since each one has its own health beneﬁts! When asked to name their one favorite whole grain food, the top choice was whole wheat bread (31%), followed by oatmeal (27%) and then a tie between popcorn and whole grain cold cereal (15% each). Whole grain pasta was the favorite of 8%. In fact, whole grain bread and whole grain cereal (hot and cold) are the two foods most likely to be eaten in whole grain form by Americans. 49% of people are aware of the Whole Grain Stamp. 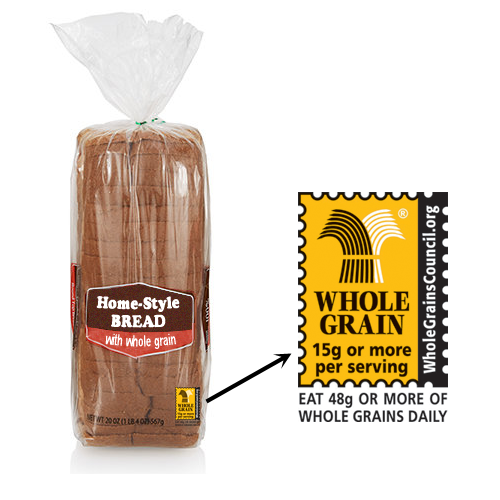 Eight out of ten (82%) trust the Whole Grain Stamp to accurately state a products’ whole grain content. 79% say the Whole Grain Stamp would make them more likely to buy a product; about half of these would also consider sugar, sodium, and other product factors. About half (51%) say they would question a product’s claims about whole grains if they did not see the Whole Grain Stamp. Click here to download the ﬁrst 4 images here, as one Infographic about our survey.